This is the first card I made using Polka Doodles sketch, thought it turned out pretty cute, and qualifies for a bunch of challenges. Do you ever get to feeling pretty smug and then realize oops, there's a small hiccup, you didn't follow the instructions? That's happened to me all week. Kind of like on your computer, sometimes you can have to many programs opened at one time, but I'm trying to hang on to my time in my studio for a little sanity. At Just Scraps Challenge we are to tell what inspired us for her New Beginnings in Pastel challenge. Well, it's been such a cold snowy winter and even here in Texas when we usually don't have snow, most of the time winter is just brown, in the Spring when the grass starts to come up in the yards and fields it's so green and fresh and it always reminds us of happy Easter egg hunts in years past. Stampin' Royalty SR#12-Get Glitter Happy! 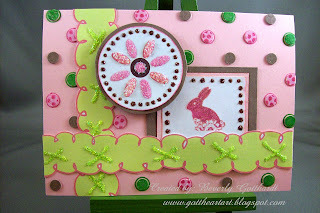 Crafty Cardmakers Challenge 17-Spring Into Spring! Supplies: Pink Card Blank 5 1/2" X 4" Halcraft, Papers: Stampin Up and scraps, Stamps: Studio G-Series 41, Ink: CTMH-Z2166 Tulip, Spica Glitter pens, regular hole punch, Stampin Up-1 3/4" circle punch, Coluzzle shape cutting template-circle, doodlebug design, Inc-sugar coating glitter, Amy's glittering Glue, Ranger Distress Stickles-Aged Mahogany, Stampin Up-Sizzix texture plate-Lg. Dots, pop dots. adorable card! This just screams SPRING! I love the glitter stitching! Thanks so much for playing with us at Stampin' Royalty this week! Way cute!! Love all the dots and sparkle!! Thanks so much for joining us in our CCEE challenge! Pretty card - nice combination of colors and use of glitter on the flowers and stitiching. Thanks for playing with us at Stampin' Royalty. Love all the sparkle on your card! I love your card - very springy and apropriately seasonal. The glitter is great! Thanks for playing with us at SR.
Oh my gosh, you participated in 10 challenges with a single card...you are good! This is too cute, great job! What a fun card, love all the polk a dots! Thanks for playing along with us at Fussy & Fancy Easter challenge. Your cards is soooooo pretty Beverly - perfect pastels! Unfortunately, I have misplaced my camera in the move and have been unable to post pictures of the cards I had made to promote this particular challenge. That makes me doubly appreciative of those who have played along anyway. Hopefully I'll find the camera soon and get pics up before our next challenge next Sunday. Thanks again for visiting us at Just Scraps! What a super cute card! Your image is adorable and your take on the circle challenge rocks! Thanks for joining us at The Pixie Cottage! Oh this is cute! Thank you for playing with the Pixies! Great card! I love the glitter! Thanks for playing along with us at Stampin' Royalty this week! Very cute and clever! I love all the yummy glitter and your colors are delicious! Great color choices. Thanks for playing along with us at Fussy & Fancy Easter challenge. Very cute card! I like what you did with your borders, glitter and all! TFS!! getting from your most recent card to this one you've created LOTS that would apply. love your stories as you blog! thank you for playing in the circle challenge at the pixie cottage! Beautiful Easter card! Thank you for joining us at Fussy and Fancy Friday!